Happy Humpday lovelies! I wish every week would be a 4 day work week, it really makes the time go by so much faster. I'm definitely a bit in shock that 2017 is only 4 days away. I feel like the end of this year really flew by. But I am definitely looking forward to what 2017 has in store for me so I say, bring it on! Yesterday I shared a few go-to last minute NYE outfits and today I'm sharing with you what I'll be rocking this weekend! We don't really have any major plans for NYE this year and I am definitely not upset about it. I used to be the type that would want to go out and party NYE but lately I've found myself extremely happy just enjoying a nice dinner, some fancy champagne and staying in playing games which is exactly what we plan on doing. Since we're (for the most part) staying in, I wanted to keep my outfit comfy but still rock some sparkle so I went with some sequin leggings for this year's New Year's Eve outfit. These leggings are super soft on the inside so they're perfect for dinner then just lounging at home. An off the shoulder sweater adds the perfect amount of sexiness to the outfit but lets be real, the second I get home I'll be throwing on a tee shirt with them and I'm not even going to feel bad about it! What are you wearing for New Year's Eve? Don't forget, today is the LAST day to enter our $500 Lululemon gift card giveaway so if you haven't already, be sure to enter below! I love those fun leggings & think a cozy night in sounds like the perfect way to ring in the new year! Those leggings are absolutely adorable! Perfect for NYE! Those pants are so fun and perfect for NYE! LOVE that red lip on you!! These are so cute! they look great on you! Love this look! I have a pair of sequin pants that I'll be wear for a bachelorette party. Love the shoes you put with them! That sounds like a perfect New Years. Cheers to 2017! Gorgeous! Love those leggings! We're keeping it low key this year and just heading to the beach with some friends! Sequin leggings are the best! What a fun way to ring in the New Year than with a little sparkle. You look fabulous! love love love this look. the red tiny pop of color and the basic tee really compliments the fun leggings! Sassy mama! Loving this outfit! The red shoes really make it. I am with you, looking forward to staying in! Gorgeous outfit! Those leggings are SO fun and perfect for NYE! Drinks some champs for me lady! What a fun look! Love the sequins on you! I love these sequined pants! You look gorgeous. Such a gorgeous look on you! These pants are absolutely fab! The end of this year really did fly by! I love the sequins leggings-- so pretty with the pop of red in your shoes! Those leggings are seriously so cute! They look so dressed up, but at the same time you no that they'll be all sorts of comfortable! LOVE that sparkle! Those are too cute!! 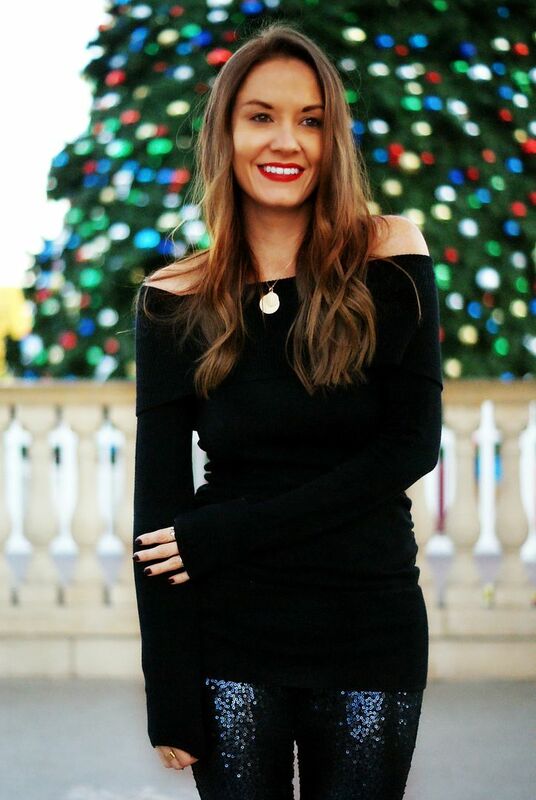 Gorgeous outfit for NYE and the holidays! Absolutely love the color of those leggings and they look amazing on you! The price is also really affordable. oooh yay for exciting things in store for you in 2017! can't wait to follow along. we are doing the same thing for NYE - staying in, with some food and champagne and a few games. i wish i had some sparkly leggings! love this look on you! Those leggings are SICK on you, babe! Wow, killin' it! :) Hope you have a fun NYE this weekend! STUNNING!! Killing it in this outfit. Loving the pop of red too! This look is beyond gorg! I love love love those sequin joggers! I love this look so much! You look gorgeous and those pants are everything!